There we were – my wife Sandy and I – zooming westward along the Pennsylvania Turnpike two Fridays ago. We were on our way to Ohio, its Cleveland area, for a reunion of some members of Sandy’s side of the family. We see a few folks from her clan regularly, but not so for the others. The occasion promised to be a somewhat reflective one, in that it was a gathering in honor of Carol, one of Sandy’s and my cousins who, in her mid-60s, died several months ago in Arkansas. There, for decades, she had made her home with her husband Mike. Carol’s brother lives with his wife near Cleveland, and it was said brother and his spouse, Steve and Carolyn, who organized the celebration of Carol’s life. The gathering turned out to be wonderful. Thirteen folks, including Sandy and I, made up the group. Everyone was glad to be with one another. Lots of hugs and kisses were exchanged during the three days we were together. Lots of good food was consumed. Happy chitchat glided effortlessly through the air. 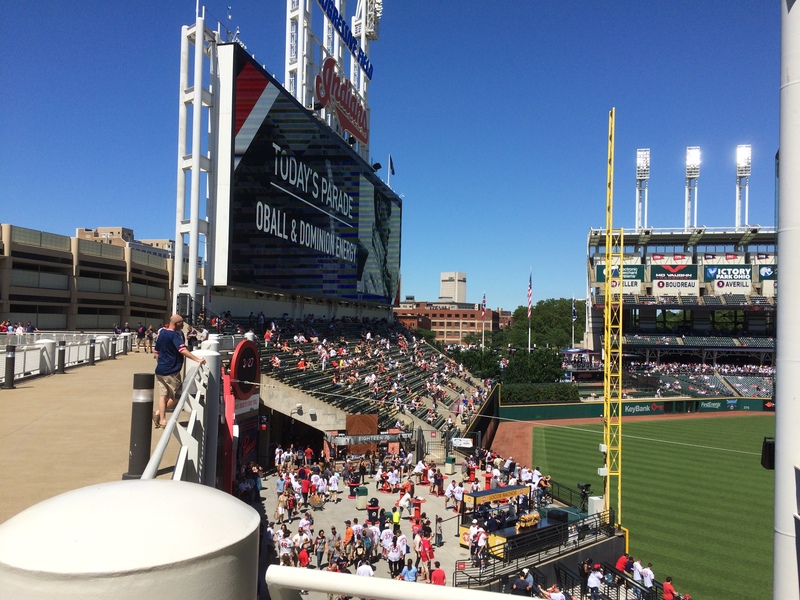 And on Saturday, in memory of Carol, we all piled into our motor vehicles and drove to downtown Cleveland to attend a Cleveland Indians baseball game, the signature event of the family members’ weekend. 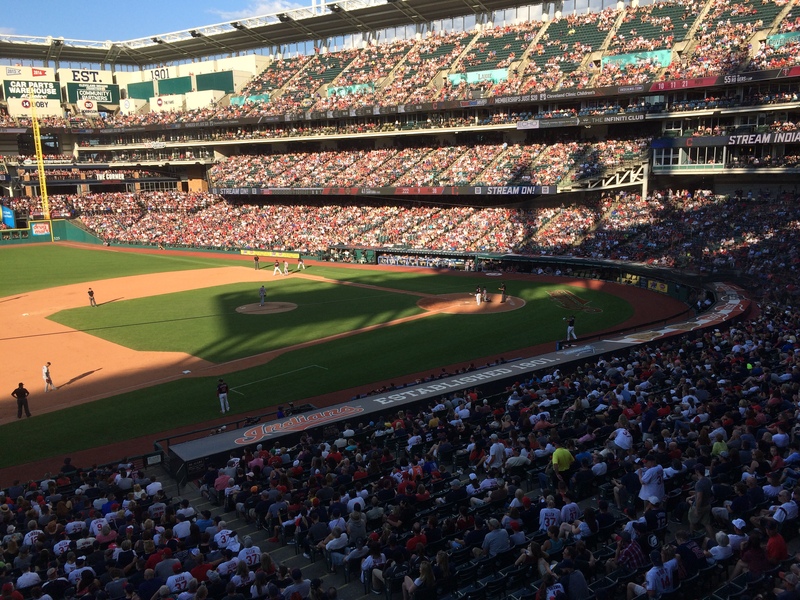 When it comes to Carol, only one thing could have been more appropriate than our visiting the Indians, and that would have been our attendance at a Philadelphia Phillies baseball game. Carol, as big a baseball fan as I’ve ever known, grew up in the Philadelphia region and at an early age became infatuated with the Phillies. That infatuation gripped her for the rest of her life. But through her brother, another baseball aficionado, she came to love the Indians too. 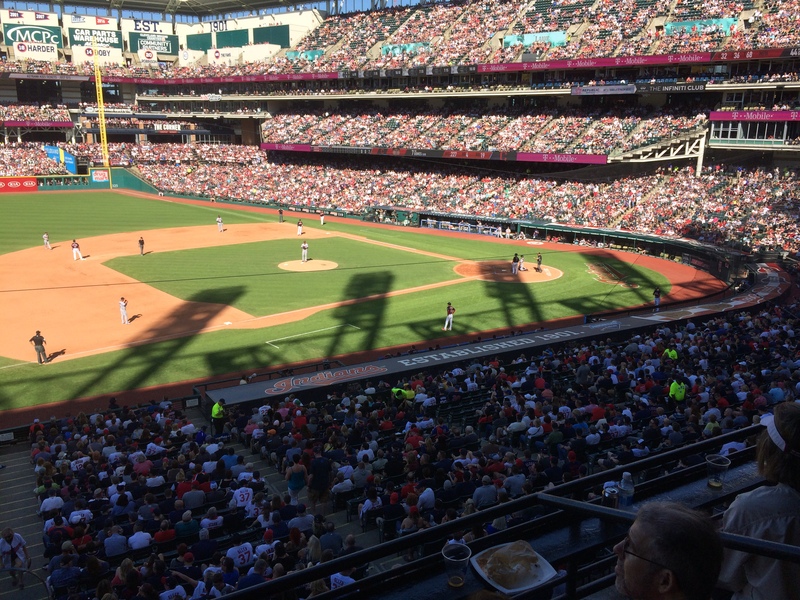 During visits to Steve and Carolyn over the years she went to a good number of Indians games. If only she could have been with all of us that recent Saturday. In her element, she’d have had a blast. 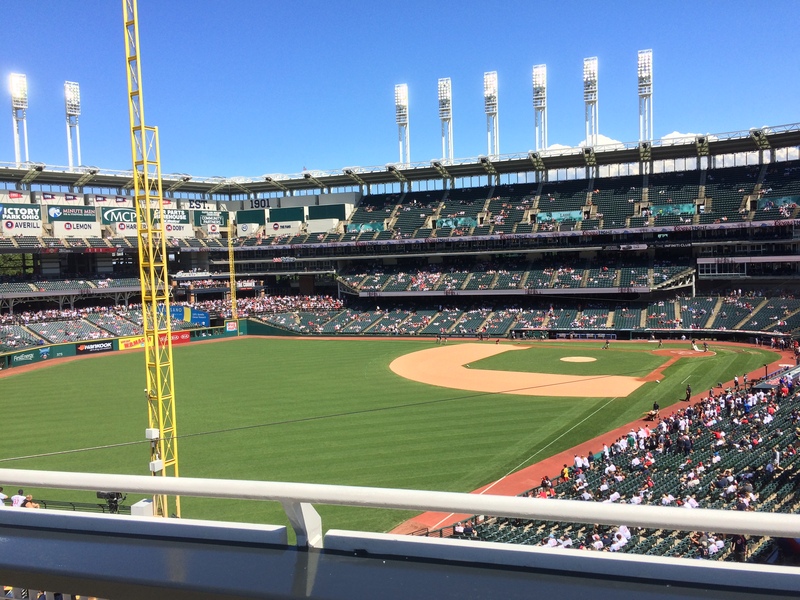 I was pretty well stunned by the beauty of Cleveland’s stadium, Progressive Field, when it came into view moments after I walked out of the parking garage. Intimate, with narrow outfield foul territory areas, it was modestly populated at 3:30 PM, forty-five minutes before game time. Hordes of fans soon would arrive. The outfield grasses, green as can be and meticulously groomed, looked magnificent. The enormous scoreboard flashed excitedly with bright-colored messages. With no rain in sight, the day held much promise. Steve and Carolyn had gone whole hog by renting a suite for the family. I’d never been in a baseball suite before, and, you know, I have to say that it ain’t a bad way to go. A guy could get used to it. There was a buffet area within the room, a frig stocked with beer and a big screen TV for those who chose to watch the game artificially. And, best of all, a clean bathroom. And there was a door that led out to the open air, to a balcony of sorts that held a dozen chairs. 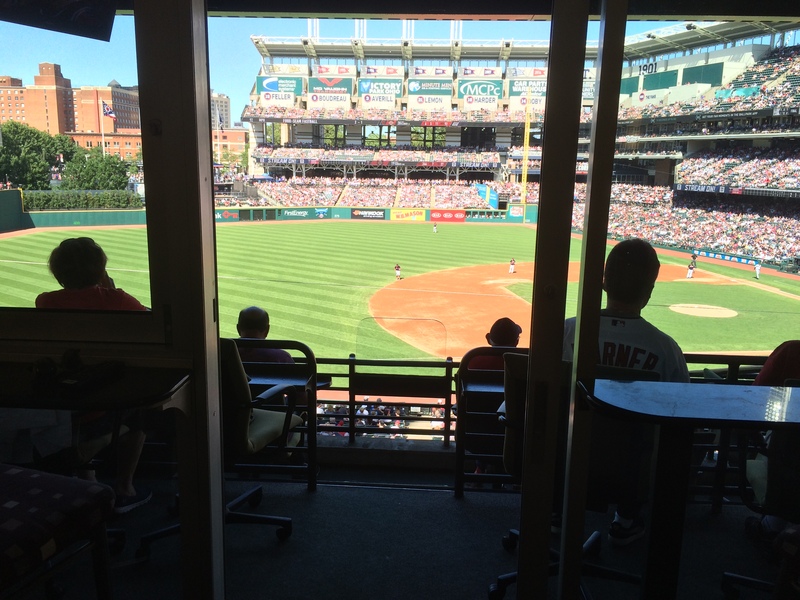 The suite was halfway down the third baseline, and from the balcony the view of the game was fine. As were its sounds. I was amazed by the high decibel level of pitched balls crashing into catchers’ mitts. Man, pitchers these days throw hard. Harder, I think, than ever before. Boom, boom, boom, indeed. Well, the game passed pleasantly, though the final outcome wasn’t favored by Cleveland rooters, the Minnesota Twins winning the battle by the score of four runs to two. Like most of the family members I paid only half-attention to the game, spending much of the time wandering into the suite for food and beverage or talking about this or that with one person or another. Or fixating on the heavy, menacing shadows that began to cover the infield midway through the proceedings. How a batter can see a ball well enough to hit it under those shadowy conditions is way beyond myopic me. Carol, though, would have watched the action on the field with an eagle eye. You have to if you’re going to document the step-by-step developments throughout a game on a scorecard, something that few people know how or would want to do. Carol, though, knew how, and did. She was a true lover of the game. Now, there was much more to Carol’s life than baseball. She was someone of wide mind and interests. But baseball is what many of us who knew her think of when we think of Carol. I mean, in Arkansas she subscribed to a special major league baseball television channel so that she could watch Phillies games. And at family gatherings it wasn’t unusual for her to be wearing a Phillies jersey. It was fitting, therefore, that a few hours after the game ended, back at Carolyn’s and Steve’s home, everyone adjourned to a large room in which a piano resided. Steve and Carolyn possess excellent musical talent. And Mike, though not in their class music-wise, is a free-spirited singer, liable to burst into song at any given moment. Carolyn sat down at the piano and Steve placed his violin on his shoulder. Their young-adult son, also in possession of musical gifts, picked up a violin too. 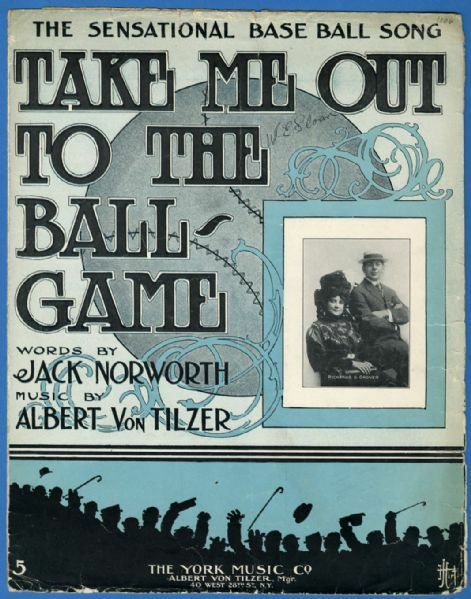 Next thing you knew a most rousing version of Take Me Out To The Ball game was under way, Carolyn hitting the keys hard and exuberantly, Mike singing with startling gusto and the two violinists fiddling away like their lives depended on it. Everyone else in the room was singing or humming along, and when the song reached its conclusion they burst into loud applause. It was by far the best rendition of Take Me Out To The Ball Game that I’ve ever heard. Another good person has left the planet. Carol, goodbye. We miss you.